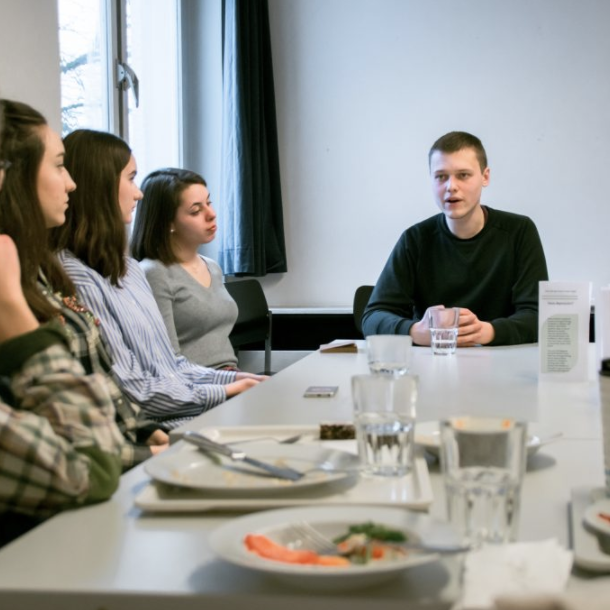 On Wednesday, March 14th, the European Humanities University (EHU) visited Bard College Berlin to partake in a round table with the finalists of an essay contest that EHU hosted, discussing “methods of (self-)education in the arts.” Around the table, the students of EHU revealed the topics of their award-winning essays, such as expressionism and the correlation between art and object (how an object should be viewed through an artistic lens), sharing how art seminars at the university transformed the atmosphere of their academic environment as a whole. Students and faculty of BCB also partook in the conversation, discussing the 20th century art of Berlin and its impact on education. Sixty essays were submitted to the contest, and four winners were selected: Olga Mikhaloy, Ulliana Kartsialiova, Olivia Patrusoyeva, and Shcherba Lizaveta. The prize for the four carefully-chosen winners was a fully-funded trip to Berlin that included museum visits and, of course, this round table event. 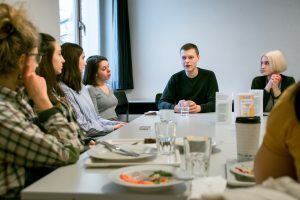 Mikalai Maksimchuk, an EHU student who also studied in the Ethics and Politics concentration at BCB, co-organized both the seminars and the essay competition and was present at the round table. The idea of the contest, according to Mikalai, was to unite the students of the university over a common interest in art as well as to educate them about the nuances of art in the digital world and the modern sphere. EHU is a college originally erected in Belarus; however, due to the government’s condemnation of liberal arts, the university was forced to relocate to Vilnius, Lithuania. The Belarusian government felt that liberal arts would lead to criticism of the government, especially of its restrictive interpretation of “democracy,” and viewed the school’s free-thinking approach to education as a negative effect of Westernisation. Now living in Vilnius, the majority of students and faculty members are still Belarusian. EHU struggled in the past as a free-thinking, creative university — one that encouraged a contemporary curriculum. Thus, a cultural project that includes seminars and essays on modern art is significant to the environment of the school, as well as to the attitude of its students. Essay winner Olivia Patrusoyeva wrote her essay on expressionism, focusing on artists such as Pablo Picasso and Edvard Munch, and on how to view art with a holistic approach — to examine how parts of a painting relate to the work of art as a whole. Her perspective is derived from attending a college in exile and experiencing how the policies of the government impact the curriculum and artistic freedom. What was clear from Olivia’s essay was that art is inherently political — a conclusion that serves to highlight the importance of this particular round table and of continuing the discussion in the broader political sphere.